Everyone wants to break up Cinderella and Prince Charming. Have we all recovered from crying over the Shan-Teng break up yet? Fear not; neither Feng Teng nor I have given up on our beloved OTP yet. But before they’re able to get back together, Shan Shan is going to be given some really harsh reality checks…from Zhou Xiao Wei? Yeah, who woulda guessed that Zhou “Shady Bangs” Xiao Wei would be the one talking some sense into Shan Shan. Feng Teng watches from afar as Shan Shan goes to her CPA prep course, afraid to make his presence known since they’re still broken up. When he drives away, the shady girl from Shan Shan’s class sees him. During class, she asks Shan Shan if her boyfriend dropped her off today, but Shan Shan just awkwardly laughs and ignores her question. This girl has “ulterior motive” written across her forehead! Shan Shan thinks to herself how even away from Windgroup, she still can’t escape from hearing about Feng Teng. Remember how Zheng Qi was all pretending that he didn’t care when Li Shu claimed to not like him? Yeah, that didn’t last long. He shows up at her bookstore and throws down his house keys onto her desk. Zheng Qi tells Li Shu that he already heard from Feng Teng that she likes him, and figured that he needed to give her some type of response. He changed the lock on his door, and now she’s the only other person to have the keys to the place. Wait, how many people had his keys before? Only you have my keys. Don’t lose em. 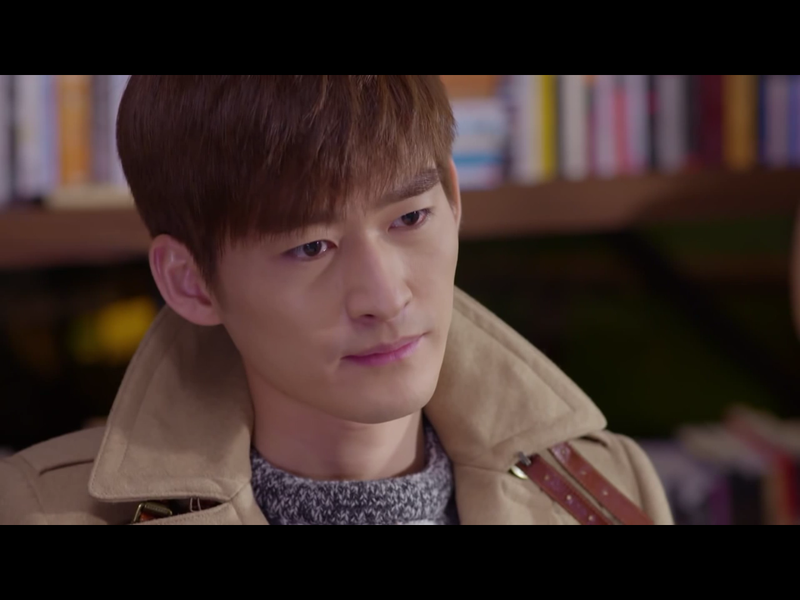 Li Shu tries to interrupt him to tell him about what happened with Feng Teng and Shan Shan the other night, but Zheng Qi tells her that he doesn’t want to hear about how she broke them up. Denial, denial, denial. Li Shu tells him that she was planning to tell him about her feelings for him the other night, but she was overly emotional then. He asks her why she got so emotional seeing another woman at his house? It just means that she really cares about him. Li Shu tells him that now isn’t the time to talk about them because Feng Teng and Shan Shan still haven’t reconciled yet. And since it’s her fault that they broke up, she can’t rest easy until they’re back together. Damn right. Li Shu hands Zheng Qi back the keys. When Shan Shan isn’t at work the next day, Zhou Xiao Wei calls Shan Shan to ask why she called out sick. She tells Shan Shan that it’s a really busy at work, and she needs to stop thinking that breaking up is the end of the world because it’s not. Zhou Xiao Wei tells her to come back to work this afternoon. After getting off the phone, Shan Shan thinks to herself that Zhou Xiao Wei is right, but then wonders how she knew and Feng Teng broke up. Hm, good question. Where’s she getting her info? During lunch, everyone’s really excited by the new lunch options in the cafeteria and the coworkers ask Shan Shan if she knows whether or not the company made a lot of money with its new product lunch. Shan Shan tells them that she doesn’t know, and figures that the others haven’t heard that she and Feng Teng broke up. She thinks to herself what a shame it is that they broke up now, right when everyone has begun to accept their relationship as the norm. Shan Shan later thanks Zhou Xiao Wei for calling her and encouraging her to come to work. She tells her that she will continue to work hard until the end of the year, and asks Zhou Xiao Wei to keep the break up a secret from everyone else for now. Zhou Xiao Wei tells Shan Shan that breaking up is no big deal, and that she shouldn’t mix her personal life with her work. She tells her that she needs to be more professional in the workplace, and that she doesn’t want to hear her talk about quitting her job anymore. Wth…why is Zhou Xiao Wei being so helpful? Shan Shan thinks to herself that Zhou Xiao Wei is arrogant, but her work attitude is quite admirable. In the latest development with the lawsuit that won’t go away, Feng Teng is informed that the company that’s suing Windgroup is suddenly demanding double the settlement amount from before. Feng Teng orders an immediate end to the settlement negotiations with the company. He tells Zheng Qi that from now on, he needs to prepare to fight back against the lawsuit. They agree to fly out to America the next day to talk with their partner company over there to reassure them that their upcoming product launch won’t be affected by this lawsuit. Feng Teng goes to the beef noodle stand to give the owner extra money, and asks her to give Shan Shan extra meat in her noodles when she comes. We’ve got a keeper here. 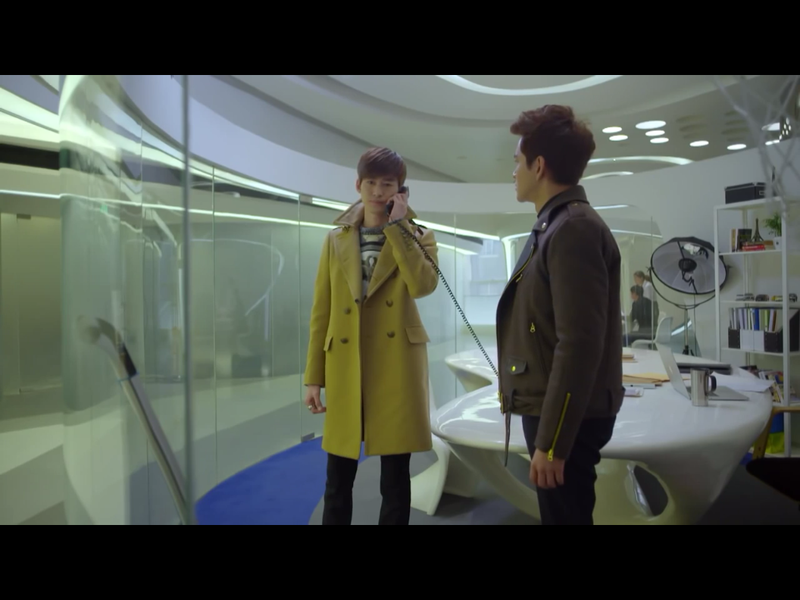 When he’s leaving, he runs into Liu Liu, who had heard everything he said. As they walk together, she asks him why he’s still looking after Shan Shan when they’ve broken up. Feng Teng tells her that he doesn’t consider them to have broken up. That’s the spirit! Liu Liu asks him why he didn’t tell Shan Shan about Li Shu’s feelings for him earlier. Feng Teng says that he only found out about that recently and contemplated with himself for a long time whether or not he should tell Shan Shan. Ultimately, he considers Li Shu to be his younger sister and didn’t want to hurt her. Liu Liu tells him that they only thing they can do now is to wait for Shan Shan to figure things out on her own, and to eventually let him explain his side of things to her. As Shan Shan is accidentally walking by Li Shu’s bookstore, she gets a text from Feng Teng telling her that he’s going out of the country tomorrow. But right after she reads his text, she sees him walking into the bookstore. Shan Shan immediately hides behind a wall, and angrily thinks to herself how she only gets a text message while Feng Teng is going to see Li Shu. She wonders if they’re even going out of the country together. In retaliation, she sneaks around to the front of the store and throws a snowball at the front door. Good aim, girl. 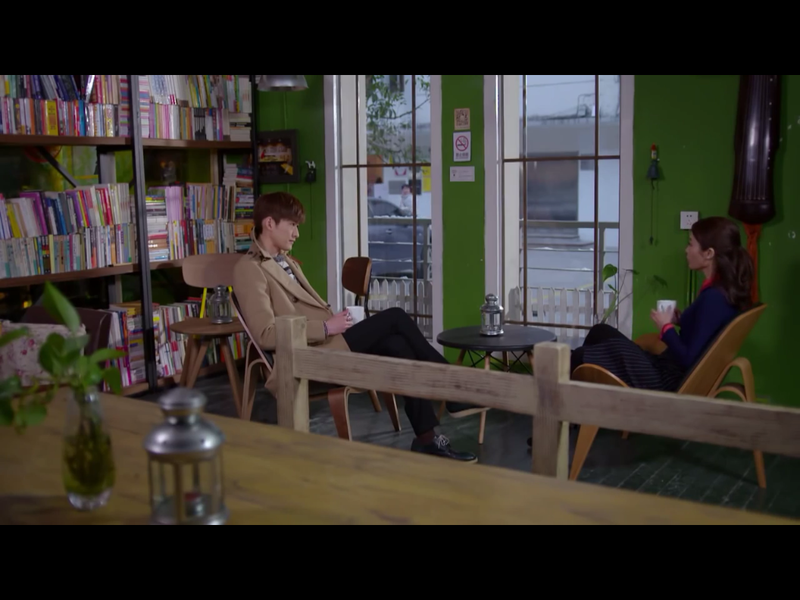 Inside the bookstore, Feng Teng tells Li Shu to go back to the mansion often to see Feng Yue now that she’s moved out. He also tells her that he and Zheng Qi are going to America tomorrow, which Zheng Qi apparently didn’t tell Li Shu. The convo turns super awkward when the inevitable topic of Li Shu liking Feng Teng comes up. Feng Teng says that he’s wanted to ask Li Shu this question for a long time…does she not think she deserves to be loved? Her mother told him before that because of her lower class status compared to the Fengs, Li Shu is always trying hard to catch up and become as perfect as possible. He tells her that even without all her success, she is still a great girl, and she deserves love even if she isn’t perfect. Li Shu, in perhaps a last desperate attempt, asks Feng Teng if that’s the case, why didn’t he love her all these years? Stop. Just stop, please. Feng Teng tells Li Shu that when you truly care about someone and want to be with them, it doesn’t have to be a constant competition, so she really needs to learn to relax. As Feng Teng’s ultimate rejection of Li Shu, he tells her that she will always be his younger sister and wishes her happiness. He encourages her to go find Zheng Qi, but Li Shu says that she’ll wait until they’re back from America because they have a lot of things to discuss. Hooray, let’s close that chapter on Li Shu & Feng Teng, shall we? Let’s not have this convo again. That night, Shan Shan tells Liu Liu about how she vented her anger by pelting Li Shu’s bookstore door with a snowball. Liu Liu says that she may have vented her anger for now, but what she really needs to do is text Feng Teng back. She tells Shan Shan that she didn’t even figure out everything before breaking up with Feng Teng. Liu Liu encourages her to not run away from the relationship just because a love rival showed up. Shan Shan contemplates texting him back when she’s back home by herself, but ultimately decides against it. The next day, Shan Shan sees Zhou Xiao Wei and Li Shu having coffee together. Wtf? Shan Shan does some quick research and find out that they both attended the same college in America, and that must be how they know each other. She then thinks back to how everyone at Windgroup always seemed to know what went on between her and Feng Teng. Before, she had assumed that it was Feng Teng’s secretary, Linda, who told Zhou Xiao Wei, but now it’s becoming abundantly clear that Li Shu was the mastermind behind all the gossip about Shan Shan at work. Dayum, how many more schemes did Li Shu have up her sleeves?! Weekly “Shady Ladies Club” meeting. Shan Shan invites Zhou Xiao Wei to have coffee with her, and confronts her about teaming up with Li Shu. Zhou Xiao Wei admits to knowing Li Shu, and is super nonchalant about working with her to break up Shan Shan and Feng Teng. She tells Shan Shan that they didn’t spread any false rumors about her because everything they said was true. Shan Shan argues that it’s none of her business what went on between her and Feng Teng in their relationship. Zhou Xiao Wei tells her that Feng Teng is a man that every woman wants, and there’s nothing about Shan Shan that matches him. But on the bright side, this isn’t a personal attack on Shan Shan because she says that even if a more perfect woman was paired up with Feng Teng, other women would still think they don’t match. She asks Shan Shan if she thinks that Cinderella received everyone’s blessings when she got together with Prince Charming. Shan Shan thinks to herself that night that although Zhou Xiao Wei was extremely cruel in what she said, her brutal honesty about the situation was very true. Shan Shan still thinks that she and Feng Teng are mismatched, and figures that she chose to run away the minute a love rival like Li Shu appeared. Taking Zhou Xiao Wei’s words into consideration, Shan Shan knows that if she’s to be with Feng Teng, then she needs to be prepared for the appearance of a million more Li Shus. She wonders to herself if this is something that can she can handle. How many more Li Shus are out there? Shan Shan is having really bad cramps the next day at work, but thinks that they’re just the usual menstrual cramps. But as the day goes on, the pain gets worse and worse. On her way home from work, she is in unbearable pain and can’t move. A woman walks by and asks her if she’s okay and if she needs an ambulance. Suddenly, blood is running down Shan Shan’s leg while she passes out. Feng Teng had just arrived back in Shanghai when he receives a call from the hospital. They inform him that his contact information was listed on Shan Shan’s ID tag that has her blood type, and that she was in the hospital right now. Feng Teng rushes over to the hospital immediately, with Feng Yue and Li Shu not far behind because Feng Yue needs to go donate blood to Shan Shan. 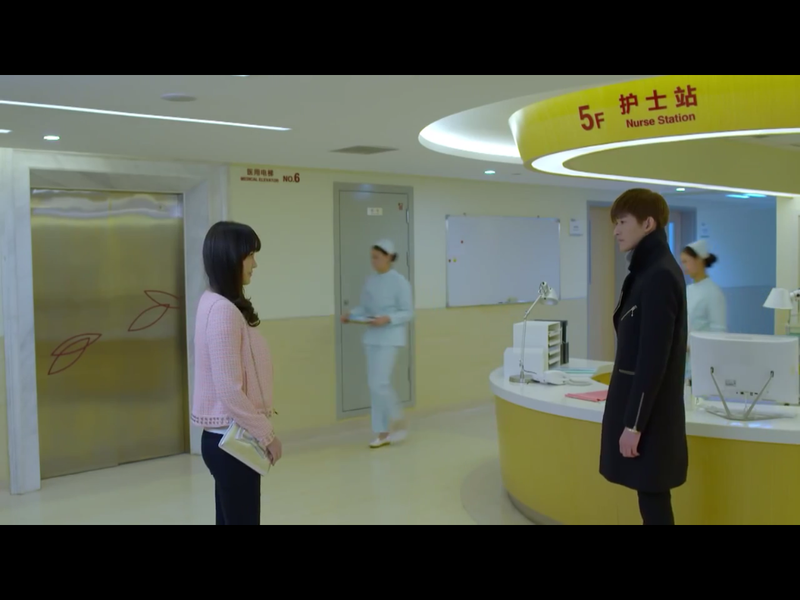 At the hospital, the doctor informs Feng Teng that Shan Shan had a cyst in her uterus that bursted, causing her to hemorrhage. She lost a lot of blood and is in surgery right now. Needing more blood to match Shan Shan’s extremely rare blood type, Feng Teng calls Zhou Xiao Wei for help. She agrees to come donate blood to Shan Shan, but tells Feng Teng that she has terms for her donation. The surgery went successfully, and Shan Shan is resting comfortably with Feng Teng by her side. 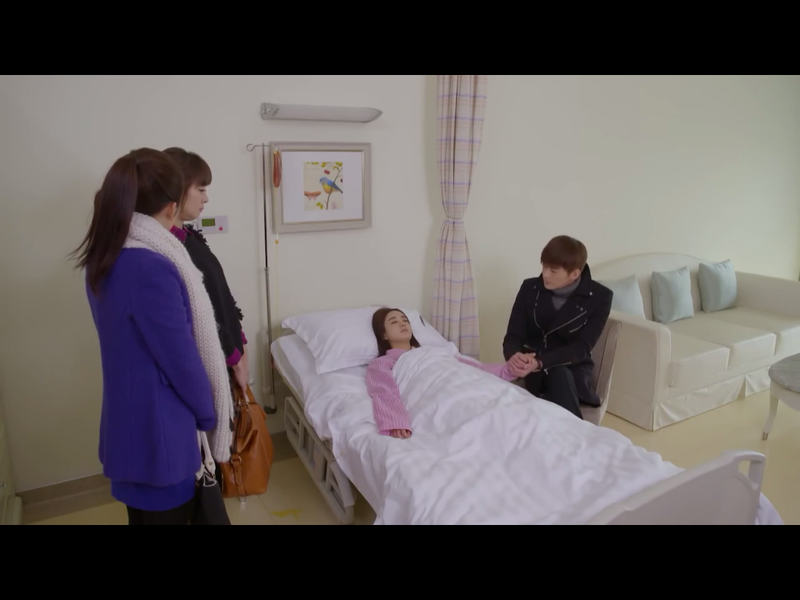 When Liu Liu and Shuang Yi arrive at the hospital to see Shan Shan, Feng Teng tells them to not tell her parents about what happened. When the two of them are discussing when they are going to come take care of Shan Shan, Feng Teng asks them to allow him to take care of her by himself. Awwww. His secretary tells Feng Teng that she’s already canceled all his activities for the next week, so he has time to spend with Shan Shan. That night, Shan Shan wakes up from the anesthesia and sees Feng Teng by her side, holding her hand. He tells her not to be afraid because he’s going to stay by her side. He says that it’s all his fault for not telling her sooner about Li Shu. It’s because he thinks of Li Shu as his younger sister and didn’t want to hurt her. He never guessed that the person he’d end up hurting would be Shan Shan. Shan-Teng reconciliation in the works! Don’t worry, Feng Teng is here. The updates to the Windgroup cafeteria’s lunch menu came as a result of Feng Teng telling the chefs to provide more lunch options for the employees Shan Shan, and that he needs to look over the menus, daily. Only Shan Shan can rock that hairstyle. Uh-oh, I wonder what those terms were for the donation….